To get Geo location (country, city, isp, etc.) based on website visitor IP in PHP application can use API from ip-api.com. 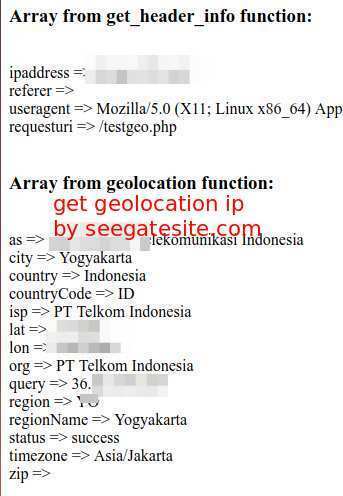 In this article, I will share how to get geolocation information from site visitors using PHP. IP-API is a free GEO LOCATION IP service with multiple response formats. In addition to free, its use is also quite easy to apply. However, free facilities have some limitations. IP-API server will automatically be banned IP Addresses if making more than 150 requests per minute. If you need more data from IP-API, you can buy a pro service. Note: The above script does not work on the localhost server.